The LEICA DG MACRO-ELMARIT 45mm / F2.8 ASPH/ MEGA O.I.S. boasts a superb image quality with minimum distortion, chromatic aberrations as well as ghosts and flares that passes a stringent LEICA standard to goes beyond their expectations. This lens system uses both an aspherical lens and an ED lens in its 14 lenses in 10 groups to realize outstanding compactness, taking advantage of the Micro Four Thirds standard to achieve dramatic downsizing while minimizing distortion and chromatic aberration. Panasonic’s MEGA O.I.S. (Optical Image Stabilizer) suppresses the blurring that is commonly caused by hand-shake, making it easy to shoot clear shots for sharply focused macro shot or in dimly lit places without using a tripod. It incorporates an inner focus direct-drive linear motor with 3 groups of floating structure for focusing, which enables excellent resolution and contrast without changing its overall length from full life-size magnification to infinity. The inclusion of stepping motor makes the focusing action smooth and quiet for use in both photo and movie recording. Seven blades give the aperture a rounded shape that produces an attractively smooth effect in out-of-focus areas when shooting at larger aperture settings. 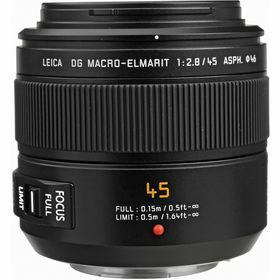 The LEICA DG MACRO-ELMARIT 45mm / F2.8 ASPH / MEGA O.I.S. lens also features a highly reliable metal mount, and uses multi-coated lens elements that minimize ghosts and flare to further enhance its optical performance.